During a tour of workplaces for their school assignment, Sumire, Wasabi Izuno and Namida Suzumeno get wrapped up in the Ghost Incident and are hurt. Boruto feels bad that he wasn't there to prevent their harm, and becomes more determined to solve the case. 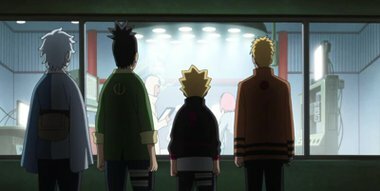 With the help of Tayori Kuroyagi the postal worker, along with Shikadai and Mitsuki, the team scans the village more closely. Then Shikadai and Mitsuki realize one possibility from something Boruto says casually.